From NEST 2.4 onwards the old connection routines (i.e. (Random)ConvergentConnect, (Random)DivergentConnect and plain Connect) are replaced by one unified Connect function. In SLI ,the old syntax of the function still works, while in PyNEST, the Connect() function has been renamed to OneToOneConnect(). However, simple cases, which are just creating one-to-one connections between two lists of nodes are still working with the new command without the need to change the code. Note that the topology-module is not effected by theses changes. The translation between the old and the new connect routines is described in Old Connection Routines. The connectivity pattern is defined inside the Connect() function under the key 'rule'. The patterns available are described in Connection Rules. In addition the synapse model can be specified within the connect function and all synaptic parameters can be randomly distributed. pre and post are lists of Global Ids defining the nodes of origin and termination. conn_spec can either be a string containing the name of the connectivity rule (default: 'all_to_all') or a dictionary specifying the rule and the rule-specific parameters (e.g. 'indegree'), which must be given. In addition switches allowing self-connections ('autapses', default: True) and multiple connections between pairs of neurons ('multapses', default: True) can be contained in the dictionary. The validity of the switches is confined by the Connect-call. Thus connecting the same set of neurons multiple times with the switch 'multapses' set to False, one particular connection might be established multiple times. The same applies to nodes being specified multiple times in the source or target vector. Here 'multapses' set to False will result in one potential connection between each occurring node pair. syn_spec defines the synapse type and its properties. It can be given as a string defining the synapse model (default: 'static_synapse') or as a dictionary. By using the key-word variant (Connect(pre, post, syn_spec=syn_spec_dict)), the conn_spec can be omitted in the call to connect and 'all_to_all' is assumed as the default. The exact usage of the synapse dictionary is described in Synapse Specification. Connection rules are specified using the conn_spec parameter, which can be a string naming a connection rule or a dictionary containing a rule specification. Only connection rules requiring no parameters can be given as strings, for all other rules, a dictionary specifying the rule and its parameters, such as in- or out-degrees, is required. The ith node in pre is connected to the ith node in post. The node lists pre and post have to be of the same length. This rule can also take two Global IDs A and B instead of integer lists. A shortcut is provided if only two nodes are connected with the parameters weight and delay such that weight and delay can be given as third and fourth argument to the Connect() function. Each node in pre is connected to every node in post. Since 'all_to_all' is the default, 'rule' doesn't need to specified. The nodes in pre are randomly connected with the nodes in post such that each node in post has a fixed indegree. The nodes in pre are randomly connected with the nodes in post such that each node in pre has a fixed outdegree. The nodes in pre are randomly connected with the nodes in post such that the total number of connections equals N.
For each possible pair of nodes from pre and post, a connection is created with probability p.
The synapse properties can be given as a string or a dictionary. The string can be the name of a pre-defined synapse which can be found in the synapsedict (see Synapse Types) or a manually defined synapse via CopyModel(). Specifying the synapse properties in a dictionary allows for distributed synaptic parameter. In addition to the key 'model' the dictionary can contain specifications for 'weight', 'delay', 'receptor_type' and parameters specific to the chosen synapse model. The specification of all parameters is optional. Unspecified parameters will use the default values determined by the current synapse model. All parameters can be scalars, arrays or distributions (specified as dictionaries). One synapse dictionary can contain an arbitrary combination of parameter types, as long as they agree with the connection routine ('rule'). Scalar parameters must be given as floats except for the 'receptor_type' which has to be initialized as an integer. For more information on the receptor type see Receptor Types . Array parameters can be used in conjunction with the rules 'one_to_one', 'all_to_all', 'fixed_indegree' and 'fixed_outdegree'. The arrays can be specified as numpy arrays or lists. As for the scalar parameters, all parameters but the receptor types must be specified as arrays of floats. For 'one_to_one' the array must have the same length as the population vector. When connecting using 'all_to_all', the array must be of dimension len(post) x len(pre). 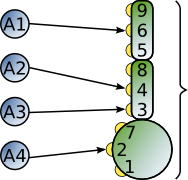 For 'fixed_indegree' the array has to be a two-dimensional NumPy array with shape (len(post), indegree), where indegree is the number of incoming connections per target neuron, therefore the rows describe the target and the columns the connections converging to the target neuron, regardless of the identity of the source neurons. For 'fixed_outdegree' the array has to be a two-dimensional NumPy array with shape (len(pre), outdegree), where outdegree is the number of outgoing connections per source neuron, therefore the rows describe the source and the columns the connections starting from the source neuron regardless of the identity of the target neuron. Distributed parameters are initialized with yet another dictionary specifying the 'distribution' and the distribution-specific parameters, whose specification is optional. In this example, the 'all_to_all' connection rule is applied by default, using the 'stdp_synapse' model. All synapses are created with weight 2.5, a delay uniformly distributed in [0.8, 2.5), while the alpha parameters is drawn from a normal distribution with mean 5.0 and std.dev 1.0; values below 0.5 are excluded by re-drawing any values below 0.5. Thus, the actual distribution is a slightly distorted Gaussian. For further information on the distributions see Random numbers in NEST. The old connection routines are still available in NEST 2.4, apart from the old Connect() which has been renamed to OneToOneConnect() and whose the support will end with the next release. This section contains the documentation for the old connection routines and provides a manual on how to convert the old connection routines to the new Connect() function. The new connection routine doesn't yet support arrays or lists as input parameter other than pre and post. As a workaround we suggest to loop over the arrays. Connect(pre, post, params=None, delay=None, model='static_synapse'): Make one-to-one connections of type model between the nodes in pre and the nodes in post. pre and post have to be lists of the same length. If params is given (as dictionary or list of dictionaries), they are used as parameters for the connections. If params is given as a single float or as list of floats, it is used as weight(s), in which case delay also has to be given as float or as list of floats. Note: Using Connect() with any of the variables params, delay and model will break the code. As a temporary fix the function OnToOneConnect() is provided which works in the same manner as the previous Connect(). However, OneToOneConnect() won't be supported in the next release. ConvergentConnect(pre, post, weight=None, delay=None, model='static_synapse'): Connect all neurons in pre to each neuron in post. pre and post have to be lists. If weight is given (as a single float or as list of floats), delay also has to be given as float or as list of floats. RandomConvergentConnect(pre, post, n, weight=None, delay=None, model='static_synapse'): Connect n randomly selected neurons from pre to each neuron in post. pre and post have to be lists. If weight is given (as a single float or as list of floats), delay also has to be given as float or as list of floats. DivergentConnect(pre, post, weight=None, delay=None, model='static_synapse'): Connect each neuron in pre to all neurons in post. pre and post have to be lists. If weight is given (as a single float or as list of floats), delay also has to be given as float or as list of floats. RandomDivergentConnect(pre, post, n, weight=None, delay=None, model='static_synapse'): Connect each neuron in pre to n randomly selected neurons from post. pre and post have to be lists. If weight is given (as a single float or as list of floats), delay also has to be given as float or as list of floats. If the connect functions above are not sufficient, the topology provides more sophisticated functions. For example, it is possible to create receptive field structures and much more! See Topological Connections for more information. Each connection in NEST targets a specific receptor type on the post-synaptic node. Receptor types are identified by integer numbers, the default receptor type is 0. The meaning of the receptor type depends on the model and is documented in the model documentation. To connect to a non-standard receptor type, the parameter receptor_type of the additional argument params is used in the call to the Connect command. To illustrate the concept of receptor types, we give an example using standard integrate-and-fire neurons as presynaptic nodes and a multi-compartment integrate-and-fire neuron (iaf_cond_alpha_mc) as post-synaptic node. The code block above connects a standard integrate-and-fire neuron to a somatic excitatory receptor of a multi-compartment integrate-and-fire neuron model. The result is illustrated in the figure. All synapses store their parameters on a per-connection basis. An exception to this scheme are the homogeneous synapse types (identified by the suffix _hom), which only store weight and delay once for all synapses of a type. This means that these are the same for all connections. They can be used to save memory. The default values of a synapse type can be inspected using the command GetDefaults(), which takes the name of the synapse as an argument, and modified with SetDefaults(), which takes the name of the synapse type and a parameter dictionary as arguments. For the creation of custom synapse types from already existing synapse types, the command CopyModel is used. It has an optional argument params to directly customize it during the copy operation. Otherwise the defaults of the copied model are taken. Note: Not all nodes can be connected via all available synapse types. The events a synapse type is able to transmit is documented in the Transmits section of the model documentation. GetConnections(source=None, target=None, synapse_model=None): Return an array of identifiers for connections that match the given parameters. source and target need to be lists of global ids, model is a string representing a synapse model. If GetConnections is called without parameters, all connections in the network are returned. If a list of source neurons is given, only connections from these pre-synaptic neurons are returned. If a list of target neurons is given, only connections to these post-synaptic neurons are returned. If a synapse model is given, only connections with this synapse type are returned. Any combination of source, target and model parameters is permitted. Each connection id is a 5-tuple or, if available, a NumPy array with the following five entries: source-gid, target-gid, target-thread, synapse-id, port.